The national government is being asked to approve the clearance of 30,000 hectares of forest on Woodlark Island under the guise of an agriculture project. The island’s forests include stands of the highly prized ebony tree and the proposed logging permit boundaries enclose the whole island. A close examination of the project proposal reveals it is riddled with errors, inconsistencies and falsehoods. PNGi has already published an in-depth analysis of the logging company’s local partner, Ebony Woods Investment Limited. That investigation reveals this supposed ‘landowner company’ is owned and controlled by a single individual; the company has no publicly registered staff or assets; and it was not even registered at the time it was given Department of Agriculture (DAL) approval. PNGi has also published an examination of the DAL approval process and evaluation report. It reveals the flaws and contradictions in DAL’s assessment. Despite numerous seemingly insurmountable barriers, DAL maintains that Woodlark has ‘enormous potential’ for large-scale agriculture development. PNGi’s inquiry also revealed that the agricultural activities recommended by DAL are completely different to those proposed by the logging company. PNGi now turns its forensic eye on the foreign logging company, Kulawood Limited, which is applying for the Forest Clearance Authority (FCA). Our investigation reveals that the firm has falsely portrayed itself as a locally owned company. Inquiries have also revealed that Kulawood Limited has no registered staff or assets despite claiming it will invest an initial K10 million into the logging operation. Kulawood was also issued with a Certificate of Compliance for an FCA when it was not an authorised forest industry participant and has included false and misleading information in its FCA application. 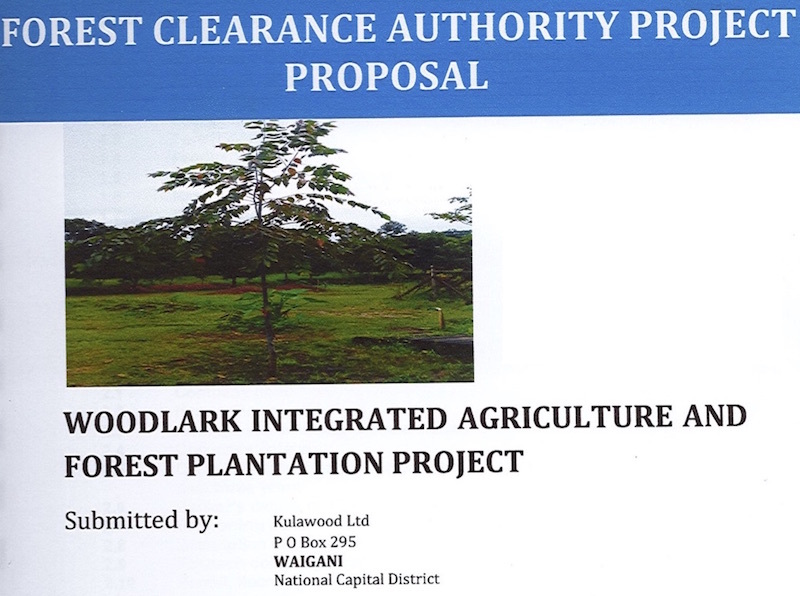 The application for a Forest Clearance Authority has been submitted to the PNG Forest Authority by Kulawood Limited. Kulawood Limited is owned by the Malaysian national, Leonard Ng Chow Leung. He and James Wanjik are the company’s two directors. According to Investment Promotion Authority (IPA) records Kulawood was first registered in July 2013, but under the name Bougainville Freighters Limited. At that time the company was owned by Joseph Ken. Bougainville Freighters Limited changed its name to Kulawood Limited in September 2016. Its shares were acquired by Chow Leung on 31 December 2017. He had been appointed to the Board 12 months earlier on 1 January 2017. The latest annual return for Kulawood Limited was filed in May 2018 for the year 2016. As of 31 December 2016 the company had no recorded staff and no assets. 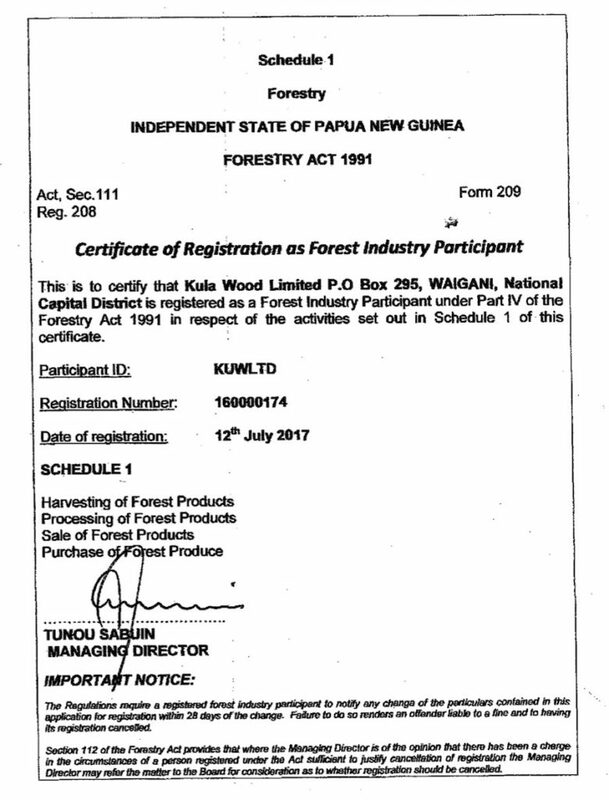 The application for a Forest Clearance Authority submitted by Kulawood Limited was stamped as received by the PNG Forest Authority on 15 February 2018. Schedule 5 of the Application proudly proclaims that Kulawood Limited is a locally owned company and refers to Section 2.4.1 of the application and Schedule 4 as providing the supporting evidence. Section 2.4.1 can be found on page 13 of the application. There the details and background of the applicant, Kulawood Limited are set out. The shareholders are stated to be Leonard Ng Chow Leung (Malaysian), 49%, and Joseph Ken (Papua New Guinean), 51%. This information is seemingly endorsed by a copy of the Company Extract included as part of the application, at Schedule 4. It is dated 9 January 2018. 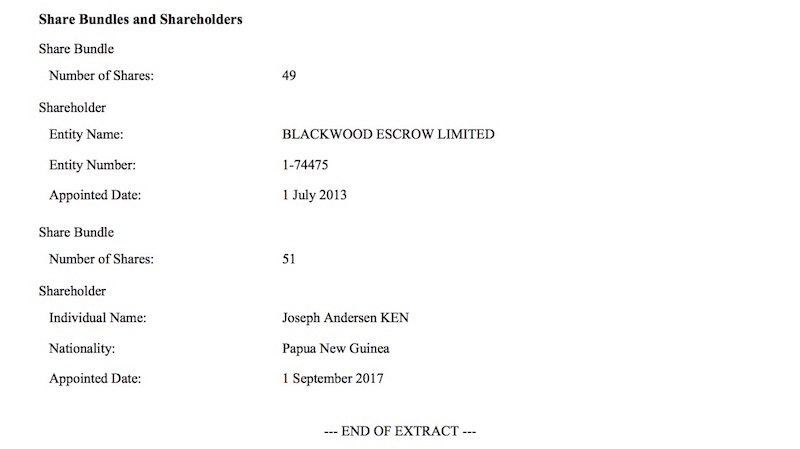 This extract states that Kulawood is 49% owned by Blackwood Escrow Limited and 51% by Joseph KEN. 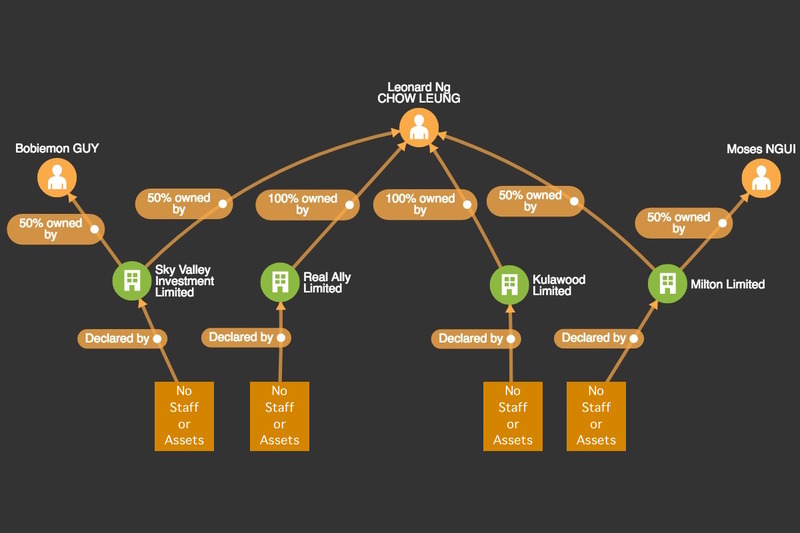 So, in three places in the FCA application, Kulawood presents itself as majority locally owned company. 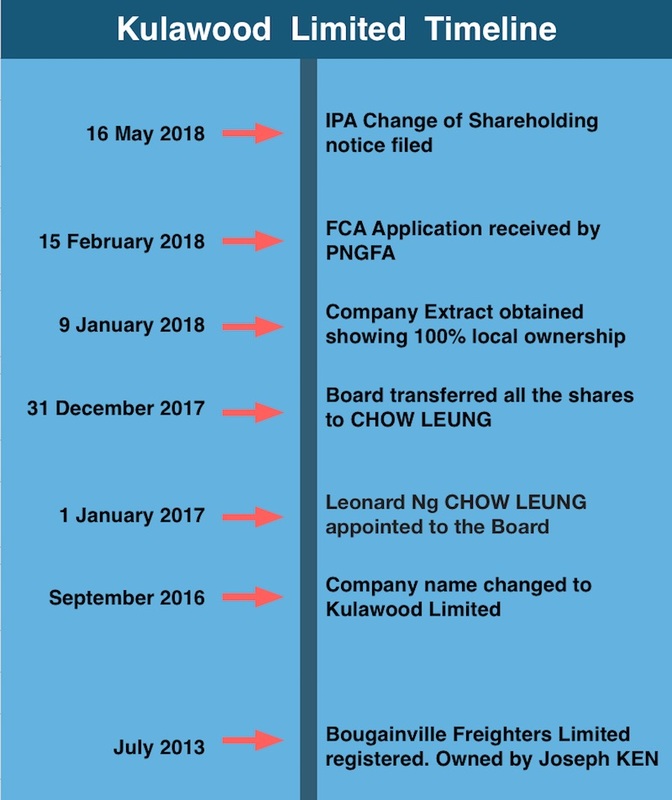 What the FCA application does not reveal is that on 31 December 2017, six weeks before the application was lodged with the Forest Authority, the Directors of Kulawood Limited resolved to transfer all the shares in the company to Leonard Ng Chow Leung, effective from that date. The information shown on the Company Extract lodged with the FCA application was therefore out of date. It was out of date and incorrect as Leonard Ng Chow Leung delayed lodging forms with the IPA giving notice of the change in share ownership until May 2018. The FCA application is therefore incorrect in three places and highly misleading. Kulawood was not at the time of the application, and is not now a locally owned company. As Mr Leung’s name and signature appear on both the Board resolution dated 31 December 2017 and the IPA notice dated 1 May 2018 and Mr Leung is listed as the contact person for Kulawood Limited in the FCA application, he cannot have been unaware of the apparent deceit. Leonard Ng Chow Leung also variously appears in the records of the Investment Promotion Authority as Leonard Chow Leung Ng, Leonarg Ng Chow Leung, and Leonard Ng Chow Leung. His first corporate role in PNG appears to have been as a director of the forestry and logging company Aset Mariah PNG Limited. Leung took up this position in July 2015. He is still listed as a board member. The company is owned by another Malaysian, Huong Mieng Ding and has two current export logging operations at Pasismanua and Umboi Island. A few months after joining the Board of Aset Mariah, in October 2015, Leonard Ng Chow Leung became the owner of a forestry and logging company, Matufi (PNG) Limited. Chow Leung’s ownership lasted only a few weeks before the shares were transferred back to the original owner, again Huong Mieng Ding. Chow Leung still though retains his directorship. Matufi is currently involved in litigation over logging operations in the controversial Pulie Anu area in West New Britain. The SABL Commission of inquiry found an SABL over the area had been ruled invalid by the National Court in 2008 but it was later resurrected. From February 2016 until June 2017, Leonard Ng Chow Leung was a director of Evergreen Limited, a company owned by the Malaysian Koh Woo Ling and Papua New Guinean Elis Banga. In 2017 Leonard Ng Chow Leung established himself more firmly as a business owner through share ownership in three companies. In March 2017, Chow Leung registered Real Ally Limited with himself as the sole shareholder. On 1 July 2017 Chow Leung purchased the shelf company, Milton Limited from Joseph Ken, the original owner of Kulawood Limited. Ken is the same person who first registered Boss Airways which later became Ebony Woods Investment Limited, the supposed ‘landowner company’ in partnership with Kulawood. Just two months later, Chow Leung transferred 51% of the shares in Milton back to Mr Ken.The change did not last long as in December 2017 Ken transferred the shares back to Chow Leung. Then in May 2018, Chow Leung transferred 50% of the shares to Moses Ngui. Both Moses Ngui and James Wanjik are directors of Milton Limited. According to the Board resolution they were appointed for their extensive experience in business and politics in PNG and with the communities ‘in the Project Area in East Sepik’. There is no further information on the nature of that project. In July 2017, Leonard Ng Chow Leung registered the company Sky Valley Investment Limited. The company is jointly owned by Leung and Bobiemon Guy. 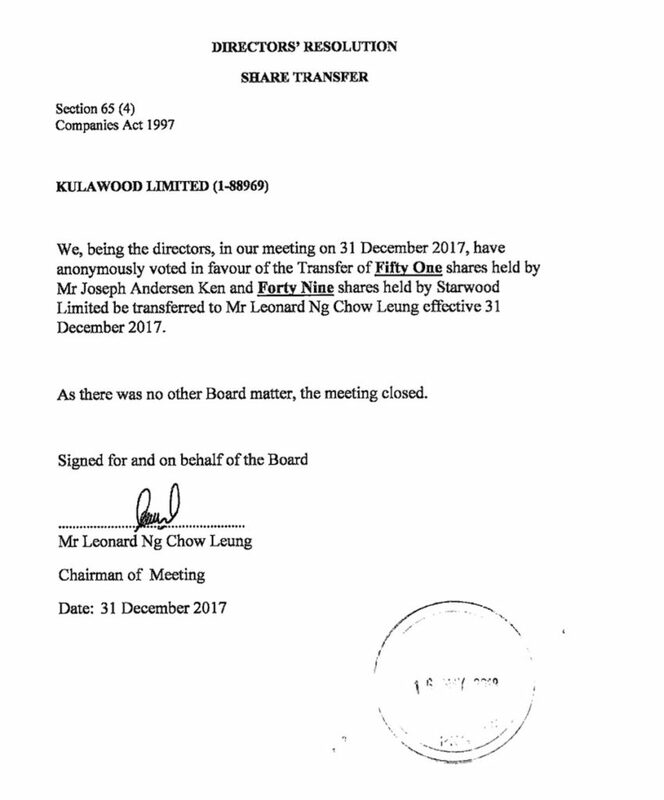 So to summarise, Leonard Ng Chow Leung owns Kulawood Limited and Real Ally Limited and owns 50% of the shares in Milton Limited and Sky Valley Investment Limited. None of these companies have any declared staff or assets. According to a media report a Leonard Ng Chow Leung has recently had his work permit cancelled. Mr Chow Leung appealed the decision through the courts. His appeal has been rejected. Mr Chow Leung’s work permit was reportedly cancelled by the Labour and Industrial Relations Minister, Mehrra Kipefa on 5 May 2018. The cancellation was due to a breach of the terms of the permit and Mr Chow Leung had failed to verify which company he was working for. Mr Chow Leung was first given notice to show cause why his permit should not be cancelled on 30 March by Labour and Industrial Relations Secretary Mary Morola. PNGi cannot verify that the Leonard Ng Chow Leung who is the subject of the media report is the same Leonard Ng Chow Leung that owns Kulawood Limited and has applied to log Woodlark Island. It is clearly though an issue that should be investigated by the PNG Forest Authority. The Department of Agriculture issued a ‘Certificate of Compliance for a Forest Clearance Authority for Large Scale Conversation (sic) of Forest’ on 24 March 2017. The certificate refers to Kulawood as a registered forest industry participant but Kulawood was not registered until four months later in July 2017. Kulawood Limited has submitted an application to the PNG Forestry Authority seeking approval to clear 30,000 hectares of forest on Woodlark island. The application sets out an initial investment of K10 million to be funded from ‘shareholder capital’. After logging the company says it will establish 30,000 hectares of tree, rubber and cocoa plantations. Yet Kulawood Limited appears to have no history of logging or agriculture and is a company with no declared assets or staff. According to its latest Annual Return it has a share capital of K100. In its application Kulawood has falsely portrayed its ownership as being 51% local and has falsely portrayed it partner, Ebony Woods Investment Limited as a landowner company. In its application Kulawood claims the support and endorsement of the Department of Agriculture, but the DAL assessment report submitted as supporting document endorses a completely different set of agricultural activities to those proposed by Kulawood. It would also appear Kulawood’s owner and director, Leonard Ng Chow Leung, may have had his work permit cancelled. Clearly there are some serious issues with Kulawood’s FCA application. They bring into question both the bona fides and honesty of the applicant and the genuineness of its long-term intentions. These issues should, it is submitted, compel the Forest Authority to reject the application. But PNGi’s analysis of the proposed logging on Woodlark is not yet complete. In Part 4 we will turn the spotlight on the customary landowners of Woodlark island and how their right to free, prior, informed consent has been abused.